In this era of accessibility for development studios of all sizes, games are more varied than ever. If you divert your gaze away from retail outlets and towards download stores you're met with a dizzying array of experiences. We may still be in the first year of the Switch eShop, but it's contributing a lot to that modern trend, with a number of talented developers making their mark on the system. 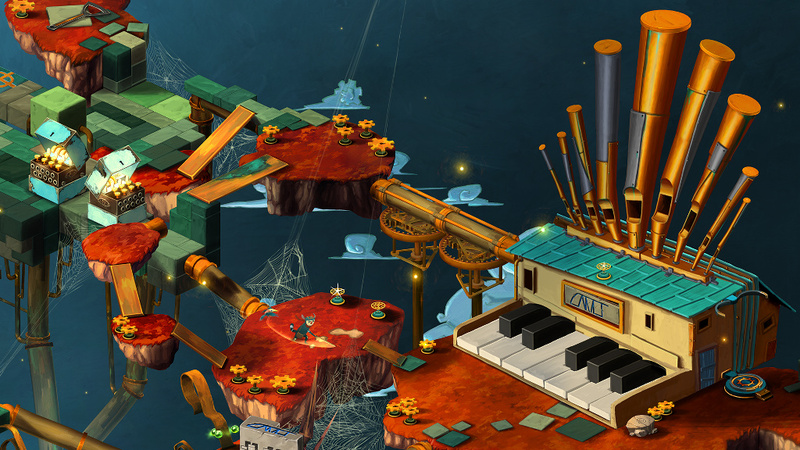 One game announcement that caught our eye was for Figment by Bedtime Digital Games - it pitches itself as a musical action-adventure, and having played the first hour on PC we can see where it's coming from. After a surprisingly serious opening we're transported into a character's mind, or at least that seems to be the case. It's a scattering of different areas of the brain, with architecture to reflect passions, fears and experiences. It's bright, colourful and on occasions rather odd, and its soundtrack is certainly a key component in driving the momentum through puzzles and occasional battles. Then, at key moments, it bursts into actual song; the few we've come across to date are peculiar and absurd, in a good way, very much reflected in the trailer below. Gameplay, meanwhile, is pretty linear and simple in the early stages, but the presentation and audio has kept us engaged. It's an experience designed with care and positioned to make you think as well as progress, with smart little gags and interesting layouts. It's the sort of game, frankly, that can only be a download title - a project that belongs in the independent space, with a concept and look that is sure to tempt those browsing virtual stores. It's a fascinating game, which is unsurprising as it's from the same developer as Wii U eShop release Back to Bed. Eager to learn more about it we had the opportunity to learn more from creative director Jonas Byrresen, as we discussed the ideas behind the game and its transition to the Nintendo Switch. Can we start off with the initial concept of the game (with music driving the narrative), how did that come together and what inspired the idea? The first inspirations and ideas for the game came due to the reception to our previous game, Back to Bed. That also had a dreamlike world that was very surreal, but that game was a straight-up puzzle game with more divided levels. The reception was very positive, and people were constantly asking "is there more story to tell, can we go and explore this world more". So, on a flight back from the US myself and my colleague Klaus started talking about whether we could take the idea of diving into the mind further, to the next step. We decided to go deeper; instead of going into a dream we went into the subconscious mind, to create a world where the player would restore something and it'd be more of an adventure game. In the start that was the focus, we always wanted it to have a unique audio side, too. But in the start the focus was very much on the visuals and the story. Then, some time in pre-production we had the chance to have an experienced audio designer - Nils - join the team, and he was also experienced in game design. Luckily for us he is also an Indie 'underground' rock musician - the best way to describe him is the Mad Hatter of music! He just started doing some weird stuff and asked to take some days to experiment with some ideas, and then he came back with a pitch of music for one of the first bosses in the game. We fell in love with the idea of having these big enemies that each represent a major fear and communicate through music. It took us back to old cartoons, in which a good villain had to have a good song. It helps set the tone, and the tone in different areas of the game is so important - the experience of getting sucked into these surreal landscapes and so on. It was a kind of luck, and also taking a chance with what was there, to go all in on the musical part. But that's game development; you never know from the start what you'll end up with. Sometimes ideas change, you fall in love with a certain concept. It's interesting that the project started without that musical focus. The visuals are also distinctive - what sort of artistic inspirations influence that design? Definitely. 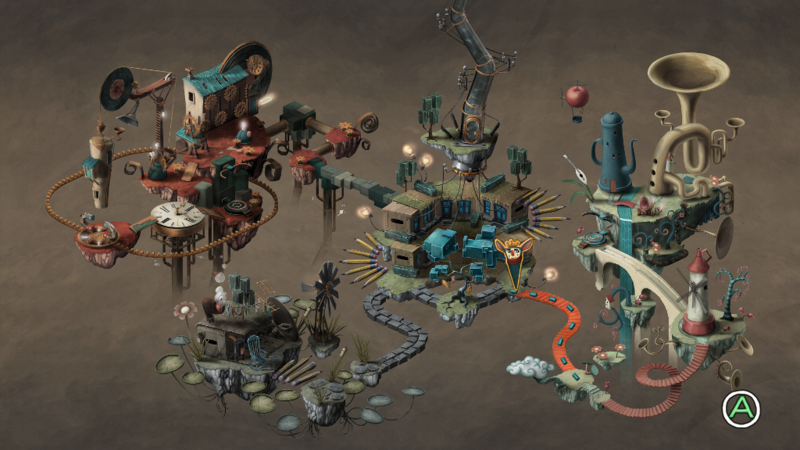 We certainly kept some ideas and inspirations from our earlier games, with multiple classic surreal artists. 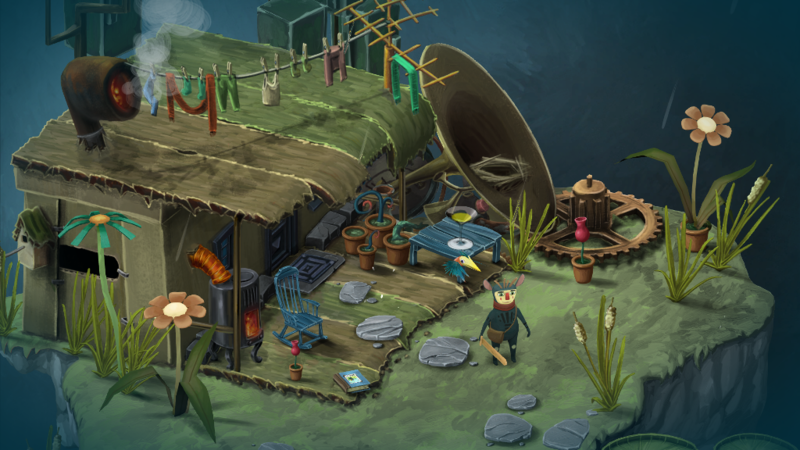 We also started looking wider - a lot of people noticed some Miyazaki in the art style. We see it as a mix between classic children's books but also classic surreal art, and then a smidge of Eastern influences. At a convention someone said it was almost like if Miyazaki did Adventure Time, that was their take on it! With games like Figment having such a distinct and artistic approach, do you feel that's one of the strengths of modern download indie studios like yours, where you can make a business out of games that - 20 years ago - likely never would have arrived? The games industry has become more mature, in that a quintessential 'Indie gamer' has now seen a lot more. Plenty have lived through the generic 'brown' years of gaming where everything was explosions and variations of dull colours. Now some gamers really want to see and hear something new, and it's something that we definitely encounter at conventions and when we go around the world. More experienced gamers want something that sticks out. It's really needed, I think - it's a combination for us in that it's interesting, and we don't want to do something that's a cookie-cutter setting, but rather something different. At the same time you need to stand out in the market. From the perspective of producing games, more tools are available that allow you to actually experiment. 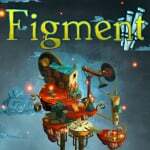 In terms of Figment's gameplay, can you talk about its overall approach and what you have tried to achieve in that area? We didn't want to go completely away from the puzzles, so they're still in the game. We did focus more on exploration and understanding the world you're in - when you come to a new area there's always a new object or mechanic that you have to understand. It's a mix of action, puzzles and exploration; sometimes you have to understand a certain puzzle or mechanic to succeed in the action parts, too. The styles work together - so after a tricky puzzle it's good to unwind with some action afterwards, and vice-versa you can relax with a puzzle if you've had a tough battle. It is very much a quintessential adventure game, as you're constantly looking for fear creatures / nightmares that you hunt down, but they're not forthcoming in standing their ground and battling you. You have to corner them, and there are long chase sequences where you try to get around obstacles to keep up with them, and they have minions in wait. I'd still call it more of a puzzle game than an action game, but it is a good mix. It very much rewards exploration, too, not just for story but also to make progress; so you might need an object to make something else work, and you need to try going in another direction to learn something new. There are also small stories hidden behind many doors in the game. Was it quite a challenge combining that gameplay design with the narrative approach and soundtrack? There were definitely challenges. 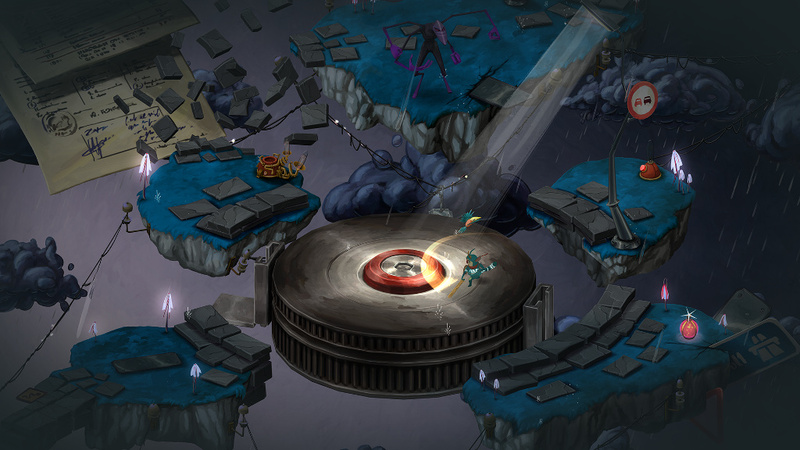 Mixing action and puzzles can be hard - the enemies need to have a clear mechanic for you to identify and counter. It's not just run up and beat everything, and the big boss events are more of a puzzle as you figure out how to get close to them and stop their actions. There's always a hidden rhythm in the music, it's very layered. We'd try to use that as cues for mechanics and certain things, so you need to try and get into that rhythm and pattern. Combining that from a gameplay perspective was a challenge - if the game was too hard we also had to consider whether to change the rhythm of the music, so linking up music and more action-heavy events was tricky. It's hard to decide what comes first, sometimes. It was an interesting journey and new, but I think we got away with it pretty well. How's the reception been to the game on PC so far? From the perspective of all of the players and reviewers we're really happy. People seem to really enjoy it and spend time with the game. It was very important to me that the game had a certain length so that player's stay in the world for a certain time, and we seem to have achieved that. I've heard from a lot of people that have been looking forward to a good time, like a Sunday afternoon, where they can just sit down and get absorbed into the game. Do you feel it is the sort of game that demands a player's attention, as opposed to the sort of title you'd just dip into for short sessions? It's designed to be enjoyed both ways. You can leave the game and come back to it - we designed it so you never feel you're caught in a stressful situation and can't leave the game. But I would say playing it for a certain time is good to get absorbed into it, and also so you don't come out of the experience. It's very much a multi-layered story - you can enjoy it as the hero just going after the bad guys, but if you read between the lines and connect the dots of what's being said and what you experience, that's actually a deep story about how the human psyche deals with different objects. How experience shapes us, the nature of fear. You need to read between the lines of what the character says and their encounters in the game. I'd say it's worth sitting down and taking the time to get absorbed into the world. In terms of the Switch version, at what point did you decide to work on bringing the game to the system? Our company philosophy is to make games that go on multiple platforms, from the start. When Nintendo was just talking about the Switch as a new concept we didn't really know what it was, so we were on the fence. But once we actually tried the Switch it was different - as I see it, it's not just another console, it's something new. We were completely in love with it. I can sit on the couch and enjoy the game, but the small screen gives you another experience that works well with our aesthetic. That's something we learnt from our previous game, that the hand-drawn style looks good on a small screen because it's almost like you're holding a picture frame and playing inside a piece of art. Every time I walk by the guys working on the Switch version I'm always hoping to catch a glance to see if the game is running on it. Because it feels so right on the Switch, so for us it was a case of "we need to get on this" as soon as we saw and tried the system. We also feel the game world fits the platform, that's a gut feeling we have. There seems to be a big appetite among Switch owners for intriguing download games on the eShop. 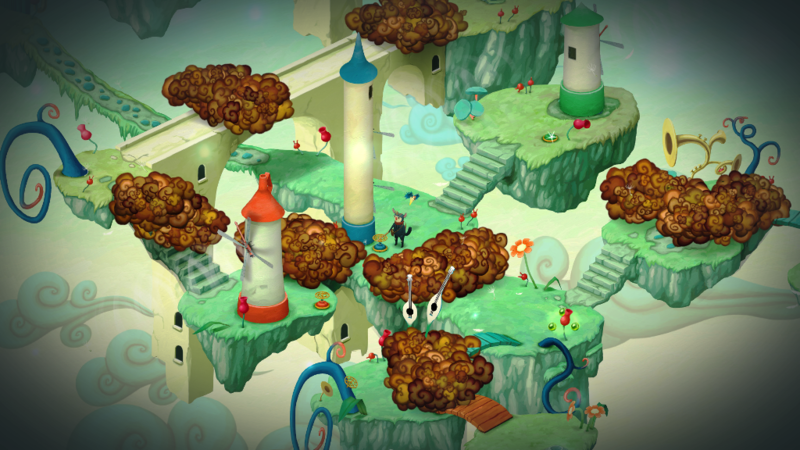 The aesthetic of Figment certainly seems to suit the Nintendo platform and audience. When we first mentioned with Figment that we were thinking about the Switch, I remember a thread on Reddit that was full of enthusiasm - this was the kind of thing they wanted. You mentioned the picture frame feel of playing on the handheld. Do you think this is a game particularly well suited to portable play with a good pair of headphones plugged in? Definitely. Especially if you plug in headphones and immerse yourself into the game world. We've seen times at conventions where that applies - we always use headphones for our demos because the sound is unique and players can really get into it. Sometimes people at PAX etc vanish into the game and don't react to anything around them, and then they realise that they've sat there for half an hour and are late for an appointment. They'd just get so immersed. I think if you put on the headphones with the portable you'll go to a totally different world. How is the Switch development progressing? What's the team's experience been like with the hardware? So far it's not been a challenge in terms of the system's speed or power. With a game like Figment it's more about aesthetics rather than fidelity, it's not about the amount of polygons to make something unique and gorgeous. It's the artistic side of it. I won't say there isn't any challenges, because there always is going onto a new platform, but it's mostly with things like different ways that shaders are set up. Different ways to handle things like saving the game, reloading and so on, which are sometimes a bit more technical on the Switch. Last time I talked with the programmer he said that technically it is running, it just encounters problems that he's fixing right now. Stuff like that does take some time, but so far it hasn't been as frightening as when we did Back to Bed for the Wii U. That was way different in terms of structure, so it's not the same kind of challenges on Switch. It's very positive, I've heard from a lot of other developers that it's not as terrifying to port to the Switch as they thought it would be. There is a power difference compared to other consoles, but I don't see Indie games like ours having that big a problem with it. We've seen an explosion of releases on the Switch eShop, with plenty of busy weeks. Do you think that momentum will hold up? Yeah, through the years we've built up a network of small developers, and you talk to each other and share experiences. From most of what I've heard some have actually had more success on Switch than they have on the other consoles combined. I think it's definitely there; I also think that there'll be plenty of Switch systems under Christmas trees around the world, so there's room there. I don't see the Switch as the same thing as the other consoles, it's kind of it's own thing, so it attracts other gamers as well. A lot of people in the company, game developers, have a tendency to be big gamers, and a lot of us are PC gamers. So the other two consoles don't really do anything for us because it's the same games, and we have powerful PC rigs anyway. But a lot of us want or already have a Switch because it's a different experience and way more interesting to us. It's a whole new market, and I have a good feeling about it. Absolutely, everyone in my family has one, including my parents. A factor seems to be the combination of the tablet form with other capabilities and ideas, it seems to draw in a lot of people. That bodes well for the eShop too, as there'll be Switch owners who perhaps aren't typical console / PC gamers. Also there's the societal change towards it being ok to buy digital, which we see more year on year, with more people buying downloads than hard copies of games. When they come onto a new platform they expect to have a download marketplace, so there are good opportunities there. In terms of Figment's upcoming Switch version, can you confirm whether it uses any unique features like HD Rumble? Also, the soundtrack is available standalone or in a deluxe version on Steam, has that been explored at all for the eShop release? We'll definitely look into it, and if there's a way to get the soundtrack onto the Switch eShop as well that'd be awesome. I'm not the one that really deals with that, and we'll certainly look at things like HD Rumble. I think for now it's just a question of getting it to run smoothly, but we definitely want to use that stuff. 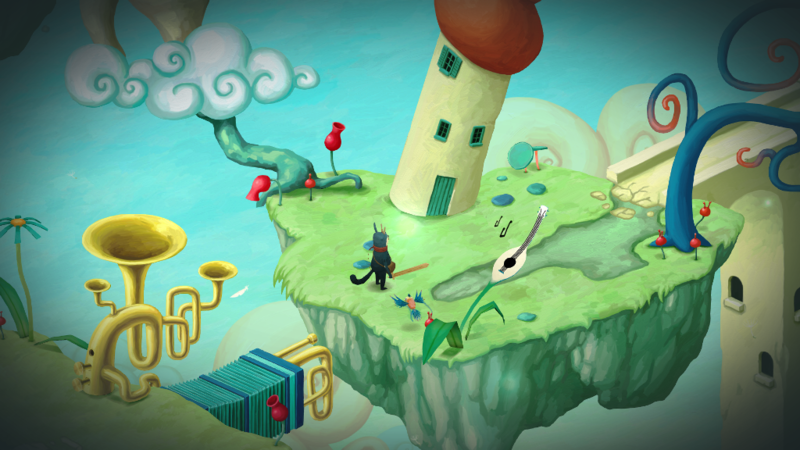 To wrap up, do you have any final thoughts about the journey of Figment as a project, and it's route onto the Switch eShop? One thing that I think people should take to heart, especially with the game coming to Switch as a console version, is that this is also a game that you can play together with other people. It's got layered storytelling, so we know that it's something that parents can play with their children, for example, because parents can help kids understand the deeper layers. We aim for it to be kind of like a Pixar movie - as a parent you're also entertained while sharing it with your kid. I also know friends who have played it with their better half, to help with puzzles and share the story, interpret it. With parts of it there's no definitive answer to what it means, so it's ok to interpret some things their own way; that's cool, and it can be an interesting experience to share with another person. It's been a fun experience since release, with a lot of people saying it's a strange mix - music and light-hearted humour with a serious topic like the subconscious and coping with fear. But I think that it's just a very Scandinavian and Danish way of dealing with it - be honest about these topics, they're relevant to a lot of people and it's ok to discuss them in a very open way. We see a lot of games nowadays tackling complex issues, it seems to be a positive step forward. For me as a creative director games are the new media; it's what movies were years ago. Movies would tackle serious subjects in different ways and there can be hidden meanings; games can be the same thing. It can be a serious topic while still being entertaining; we just do it in a way where we can combine gameplay, visuals and music. So in a way it's a new media, and we need to have interesting themes and discussions. The goal is to have game design and story work together, where neither is overshadowing the other. I think that's what you need in games as a medium. Because we also see story-driven games that have no game mechanics; they might have a good theme, but sometimes I'm left feeling that I could have seen it as a short movie and had the same experience. So to get it right is to try and have a lot of things combined to help each other. With Switch and Figment it represents a project with a lot of time, stress, blood, sweat and tears - I'm just really looking forward to getting it out there. We'd like to thank Jonas Byrresen for his time, and Lewis Denby for his assistance. Looks like what I would expect if Banksy was commissioned to make a Mario game. "It's very positive, I've heard from a lot of other developers that it's not as terrifying to port to the Switch as they thought it would be. There is a power difference compared to other consoles, but I don't see Indie games like ours having that big a problem with it." Exactly. The Switch is much stronger than the other consoles. Of course they would mention it, because the sheer amount of extra power is a refreshing change. @Bondi_Surfer I bought this game for that very reason... I think. I'm not gonna lie, this looks so raw I just HAVE to check it out! @GC-161 Shooting a wall for ages has never looked better! I like it. It's quirky, and different, and the designers must have been using some questionable substances (or, considering their whereabouts, copious amounts of beer) but it does intrigue me more than enough to keep an eye on it. @Whopper744 Thank you for doing this so I didn't have to. 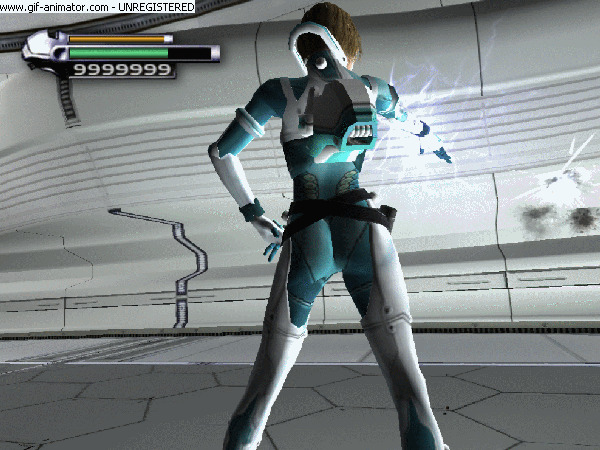 @Agramonte You can play P.N.03 on a wii, tho. I would buy it again if Nintendo sets up a Gamecube Virtual Console on Switch. @GC-161 yep, same here. Day 1 buy in my book. Looks interesting, I’ll take a look at it. I wish David Lynch would make a video game. I was lucky to play the finished version of this leading up to release back in August, and to hang out with the creators for a bit in September during a world building seminar. Glad to see more Denmark on Switch. Hopefully Hat in Time will make it on there as well eventually, so Jonas don't have to receive as many death threats. Anyway, Figment is super recommended!